Addressing what some would call a drawback of modern computer design, Apple has developed a system that provides users plug alignment assistance for hard to reach ports normally located in the rear of desktop enclosures. Published by the U.S. Trademark and Patent Office on Thursday, Apple's application for "Electronic devices with connector alignment assistance" details an automated system capable of sensing an incoming input connector, determining its orientation and guiding a user to correct insertion. Computer makers have for years hidden unsightly ports —USB, FireWire, audio, video and more —on the rear of computer enclosures, a design that, while aesthetically pleasing, is limited in its functionality. For example, users attempting to plug in a USB cable might find it challenging to achieve the correct horizontal and vertical alignment or proper plug orientation. In the same way, a user might forget whether or not a port is occupied or where it is located. Apple proposes a method of monitoring a plug's location and orientation relative to an input, either through sensor data or visual information gathered by cameras. For example, an electrode array might determine that a plug is nearby, while a camera and image recognition software can ascertain orientation information. Apple's invention covers x-, y- and z-axis positioning, as well as connector-specific orientation as detected through real-time image recognition reckoning. Ideal sensors for the job include capacitive, light-based, proximity and more. Depth perception can be determined via stereo cameras or a single 3D camera. Illustration of camera (left) and electrode array plug sensing. The invention's second stage processes alignment or misalignment data and relays it to a user through audio and visual indications. Some embodiments call for logic-based voice instructions like "move plug left" or "move plug right," while others rely on simple tones. Users might also receive assistance with onscreen text and graphics. In one potential embodiment, LEDs deployed behind micro-perforations in a computer chassis are programmed to illuminate visual cues like right and left arrows, an "X" to denote a port is occupied, text and other notifications. An iMac might feature a one-to-one representation of its rear ports, displayed via an LED array installed in the front-facing bottom "chin" portion, for example. There is no evidence that Apple intends to incorporate such functionality into its Mac lineup; the closest approximation is the Mac Pro's motion-sensing LED-backlit port array. A number of products could do with some type of guidance system, however, especially unwieldy all-in-ones like the 27-inch iMac. 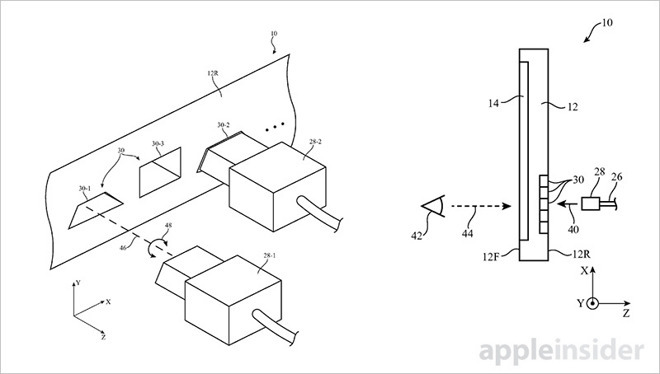 Apple's port alignment patent application was first filed for in July 2014 and credits Christiaan A. Ligtenberg and David G. Conroy as its inventors.